I finished presenting a paper at an academic conference in Phoenix on authenticity, specifically the media portrayal of the ancient skeleton Kennewick man. And then authenticity hit the fan. I was surrounded by stories of Indian verisimilitude. Here’s what happened: I took a trip to the Heard Museum for a tour about the Chiricahua Apaches, and our guide told stories about Geronimo. What was striking was to hear a description of the tribes, culture and peoples from a distant vantage point. From a non-Indian vantage point. Our tour guide seemed to glean his information from the exhibits rather than from his own experiences or research, and when one of the visitors asked where Geronimo was buried, the tour guide said Fort Sill. Apparently the tour guide hasn’t followed the controversy over Geronimo’s bones. The story is that the bones were stolen from the grave in Fort Sill. But the tour guide didn’t mention it. Like Kennewick Man, a dispute over the bones occupied news coverage for months. 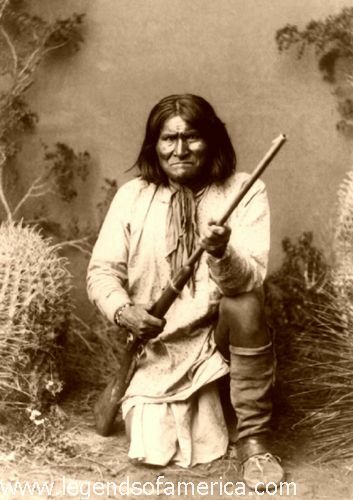 Geronimo’s grandson sued to have the bones recovered. The case was dismissed. Our tour guide said Geronimo sold his autograph and even the buttons from his jacket. The implication was that the Indian leader knew how to cash in on his fame. But what we miss from the tour guide’s interpretation of Indian-ness is an authentic description of what life was like for Geronimo in his mature years. Maybe selling buttons was a way of having the last laugh. This entry was posted in authenticity, ethics, framing, Geronimo, Indian, journalism and tagged Indigenous Science, literacy, stereotypes. Bookmark the permalink.